345, is another number that derives from universal law and is used as a mathematical principal, that is preserved in mythology. Long before Pythagoras, men new of the rule that a triangle with sides 3, 4 and 5 units yields a perfect right angle, and builders used ropes knotted at intervals of 3, 4 and 5 units in order to ensure exact right angles for their stonework (in fact, the 3-4-5 right triangle is often called "Egyptian"). 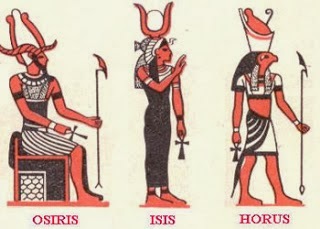 The stories of Osiris (Ausar), Isis (Auset), and Horus (Heru) are familiar tales from a long ago culture often demoted to a pagan religion when in fact, it is designed to teach us so much more. "The God Ausar and the Goddess Auset were King and Queen in Khemet. Their brother, the God Set was jealous of Ausar and murdered Him. He took Ausar's body and threw it in the river. Auset was then removed from power and Set took over the rule of the country, reigning as a tyrant. Auset searched tirelessly for the body of Her Husband. When She found Him She performed ritual. Through ritual, the Spirit of the God Ausar came to Auset, and through Their Divine spiritual union Auset became pregnant with Heru (Khensu). Auset comes to find Heru has been stabbed by one of Set's associates. She embraces the body of Her Son and laments. Her Sister, the Goddess Nebt Het laments with Her. Another Goddess, Serqet, tells Auset to call on Ra in Heaven. Auset calls on Ra. Ra sends Tehuti down from Heaven to facilitate the resurrection of Heru. Heru goes on to defeat Set and take over the rule of the world. Heru, Auset, and Nebt Het then resurrect Ausar." Phi, the Golden Ratio that appears throughout nature. Pi, the circumference of a circle in relation to its diameter. The Pythagorean Theorem – Credited by tradition to mathematician Pythagorus (about 570 – 495 BC), which can be expressed as a² + b² = c². "The right-angled triangle is another form of this figure which is deserving of attention. Among the Egyptians, it was the symbol of universal nature; the base representing Osiris, or the male principle; the perpendicular, Isis, or the female principle; and the hypotenuse, Horus, their son, or the product of the male and female principle. This symbol was received by Pythagoras from the Egyptians during his long sojourn in that country, and with it he also learned the peculiar property it possessed, namely, that the sum of the squares of the two shorter sides is equal to the square of the longest side-symbolically expressed by the formula, that the product of Osiris and Isis is Horus." "The contemplation of this figure leads to an understanding of one of nature’s most common forms of growth, growth by accretion or accumulative increase, in which the old form is contained within the new." "The vertical side named by Osiris represented the three vital principles: Salt, Sulfur, and Mercury. The long horizontal side named by Isis was the expression of the four basic elements: Fire, Water, Air, and Earth. Finally, the hypotenuse named by Horus showed five divisions, representing the five stages of the development of Life: Minerals, Plants, Animals, Humans, and Enlightened Ones." There is knowledge in stories. Myths of different cultures were much more than a way to memorialize ancestors and learn life lessons. In fact they were keys to gnoisn aka noesis, a much greater level of knowledge. 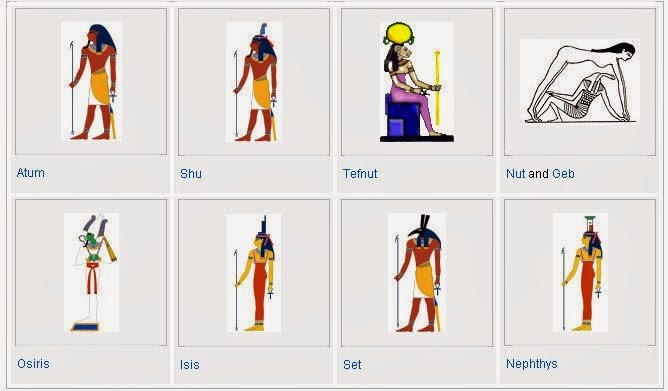 It is becoming clear, based on historical findings of ancient texts and understanding of symbology, that long before the Greeks claimed intellectual brilliance, men in ancient Khemet, also know as Egypt by the Greeks, understood the importance of numbers. It is from Khemet, that we get the words chemistry and alchemy and much more mything gnoisn! 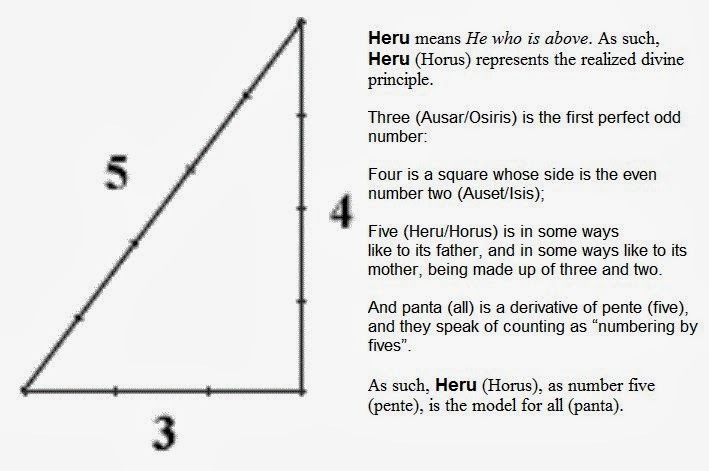 Several figures have been associated with mathematics in ancient times, but Horus, Sesheta and Thoth, are the triad associated with math in Khemet. Sesheta was known as the Goddess of knowledge and Thoth was thought to be her male counterpart and she was often depicted as his wife by the Egyptians. The child of this union was a god named Hornub, 'The Gold Horus'. The Egyptians believed that Seshat invented writing, while Thoth taught writing to mankind. Horus was he who fought the forces of darkness (in the form of a boar - a pig) and won. In the course of the battle, however, one of his eyes was torn from his face. Thoth, restored it, and it became a symbol of wholeness, the uat, and came to represent the basis of all Egyptian mathematics as we know it - the unit fractions. Each part of the eye is a part of the whole. All the parts of eye, however, don't add up to the whole. This, some Egyptologists think, is the sign that the knowledge can never be total, and that one part of the knowledge is not possible to describe or measure. "Mutiplicity is division NOT multiplication so 1 becomes 2, 2 becomes many and many becomes 1 again... "
There is nothing as perplexing in mathematics as the concept of creating something from nothing. The modern complex formula of how does 0=2 was solved by the ancient Egyptians in Zep Tepi " The first time" when they realized that Zero is the totality of all there is. This is how something comes from nothing. It is obtained through division of the whole into two equal but opposite natures which when broken into their smallest component atom (atum), became the many. From these many a multitude of possibilities comes forth that can be built into one whole unit or many individuals, but whether there is one or millions, they all dissolve into nun. 0,1,1,2,3,5,8,13,21, 34 commonly known as the Fibonacci Series was actually built into ancient Khemetic science in the creation story. The first initials of the great ennead "nine" Gods spells AST GNOISN "The seat of knowledge"